In our own Simulation Center, we enable team training and further education in pediatrics. What is our Pediatric Simulation Center? Together with the Department of Pediatric Cardiology and Intensive Care at the hospital of the Ludwig-Maximilians-University Munich Germany, we operate our own Simulation Center. There, we train each of our crew member at least once a year to continually optimize patient safety and emergency management. We also offer team training and pediatric emergency seminars for the staff of other hospitals, external doctors, nurses and rescue personnel. How is our Team Training performed? Team Training in our Simulation Center offers the possibility to train a wide range of clinical situations in a realistic, safe and reproducible manner, in order to improve medical actions and procedures. Our courses are intensive training programs on advanced simulators and cover all aspects of medical incident management and the prevention of critical events – Crisis Resource Management (CRM). We want to take the participants’ uncertainty from emergency situations in children. To this end, they are confronted with realistic scenarios, which are then analyzed and discussed in detail using video recordings. The aim is to ensure the best possible patient safety through an optimal preparation for pediatric emergency situations. Team Training for external participants! We offer courses for external participants (emergency physicians, rescue personnel, external children’s hospitals, etc.) in our Pediatric Simulation Center or at in-house trainings in external clinics and facilities. 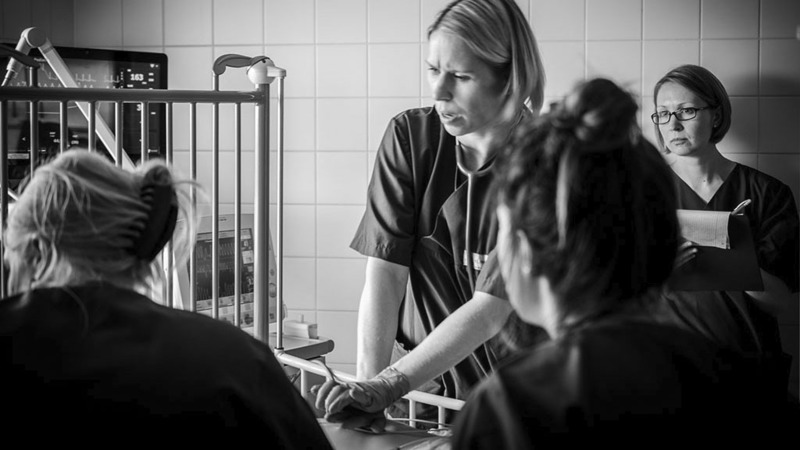 Our courses correspond to the recommendations of the Society for Neonatology and Pediatric Intensive Care of Germany for the “Curriculum simulation-based in-situ team training for inner-clinical emergencies”. • skill training: alternative airway aids, intraosseous puncture, etc.